I’ve been putting off writing the ‘Goodbye to all that’ end cap to the Broken Empire trilogy for a long time. I could have written it before PRINCE OF THORNS was even published, before I had any inkling what it was like to have my work read by more than half a dozen people. The trilogy was complete in early 2011. I’ve avoided writing this for so long because the experience has been so multi-faceted and hard to pin down. It looks different from every angle. Each time I consider what I might say I come up with a different narrative. On sending out copies of EMPEROR OF THORNS recently I’ve taken to adding in ‘Thanks for being part of the journey’. Because it definitely has been a journey, both for me and for Jorg Ancrath. My own journey had been in two parts. Firstly there’s been the writing: that isolated collection of late nights spent just pursuing Jorg Ancrath across the page – through his exploration of both the world he inhabits and the person he’s growing into. I don’t plan my stories. I don’t know what will happen next, not in the next chapter, not on the next page. I don’t know what’s coming, what secrets will spill out, who will die when, what the twist will be. I just type and it happens. It’s an endless what-if, what-next, a structured dreaming if you like. And so writing is for me the same adventure that reading is. I’m very glad I wrote the trilogy before anyone started reading it. Not knowing if the work would sink or swim, not knowing if anyone would give a damn what happens, proved to be very freeing. 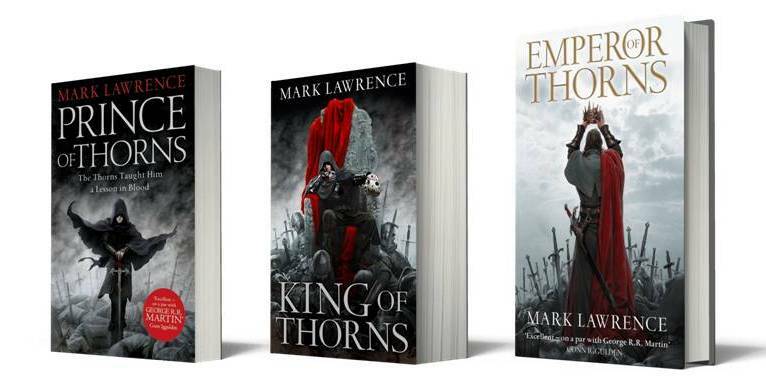 My editor said on reading KING OF THORNS ‘it is shaping up to be the most extraordinary work of fantasy I have ever read: because you take such risks’. When I wrote it I wasn’t aware that I was taking any risks. When I wrote it I had no reader expectations to meet. It’s easiest to gamble when the stakes are low! The second stage of my journey has been the watching. The internet gives modern authors the opportunity to see their work spread among the readers and read/listen/watch their reaction on blogs/podcasts/YouTube. Seeing the diversity of interpretation and response, and the passion with which those responses are often offered, has been as interesting in its way as having the story unfold before me on my laptop. I’ve loved interacting with the online reading community. I’ve been asked about the difficulties in writing a story with many time layers and developing a character as I go. I sometimes feel I should wax lyrical about the skill and labour involved in order to lend gravitas to the end product. In truth though there’s been little effort required. The story flowed from my fingertips without stress or strain. I think in layers. I exist in layers. My past is always with me, informing my present. It seems only natural to write that way. And as for Jorg – he just grew, as children do whether you want them to or not. We’re built of memory and experience, we’re dynamic, evolving, and moments of crisis focus our past onto our present. This is as true of me at my desk and of at the person at the supermarket checkout as of Jorg Ancrath carving a path toward a throne. Stories have a beginning, a middle, and an end. I began with a character, I gave him a purpose, I grew him around it. And now it’s finished. There is, I feel, a power in knowing when to end something. Deciding to stop telling Jorg’s tale is doubtless not a wise move commercially. Received wisdom is if you find that rarest of things – something that works, something that sells – keep pushing it until it stops working/selling. The number of Aliens films is determined by market forces not aesthetics. Jorg’s story is a trilogy. I hope that with EMPEROR OF THORNS I have quit while I’m ahead and on a high note. I hope that by stepping away I’ve left something of worth behind. Many stories are built to roll on. Many excellent characters are essentially static – the same formula applied to ever-changing problems to entertaining effect. Detectives just need crimes to solve. Sherlock Holmes could roll on forever. Secret agents need plots to foil. We could have twenty James Bond books or films and still want more. Jorg’s story however is primarily about Jorg. Ranging back in time to reveal his past, and forward to watch him grow, to watch him resolve the questions about who he will be. That’s the kind of story that when it’s done is done. To push it past its sell-by date would make caricature out of character and blunt revelation through repetition. To everything there is a season, and Jorg’s tale has been told. The Broken Empire, however, is a different story – several in fact – and my next job is to sell you on another one.